It’s pretty well agreed upon that there is a sense of romanticism that settles around FDR, as well as his wife Eleanor. FDR managed to lead a country through wartime while battling debilitating illnesses and Eleanor has been an inspiration to generations of women. It should not be surprising that two such extraordinary individuals had an extraordinary marriage, but it does as a President’s private life is often treated as just that, private. I for one have always been a great admirer of Eleanor Roosevelt. She was a strong silent presence in Franklin’s life and always stood by him. While this may have caused her to have a bit of a martyr’s complex, having to play the role of a put-upon wife, she was always willing and ready to put the needs of others, especially her husband’s before her own. Franklin relied on Eleanor and in turn supported her causes where he could even when certain issues, such as Eleanor’s support for Civil Rights, could hurt Franklin’s popularity. Even though the couple spent a great deal of time a part, especially during the later half of their marriage while Eleanor was traveling supporting her own causes and Franklin was constantly visiting other world leaders during the Second World War, their letters to one another show a level of tenderness and love. While they may have taken other lovers, it is very clear that Franklin and Eleanor were life partners and needed, and loved each other vey much. 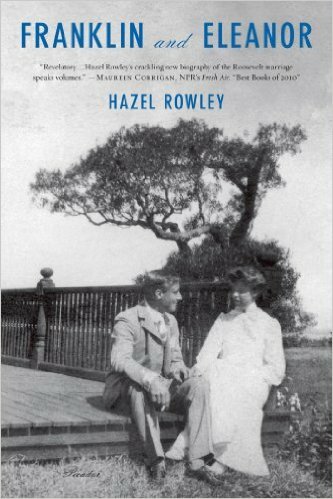 This entry was posted in Reviews and tagged America, Biography, Eleanor Roosevelt, FDR, Franklin and Eleanor, Great Depression, Hazel Rowley, History, Love, Marriage, Non Fiction, Partnership, President, Review, Roosevelt, United States, World War Two on September 22, 2015 by kwils3.